Arthur Edward Cornell was born and grew up in Chelmsford where he worked as ashop assistant and milman. He became a Territorial soldier at the age of 16 and was mobilised at the outbreak of the war. He served in Italy and was killed in action there in November 1943. His home was in Railway Street, Chelmsford. Arthur was born in Chelmsford on 30th December 1916, the son of Albert Edward Cornell (1886-1965) and Susan Cornell (nee Ellis) (1888-1968). He was baptised at Chelmsford Cathedral on 21st April 1917. At that time his home was 5 Railway Street in Chelmsford. His parents had married at Galleywood on 20th April 1908. Arthur's siblings were Ivy Myrtle Cornell (1910-1998), Amy Annie Cornell (1913- 2000), Eva Olive Cornell (1917-1918), Christopher Charles Cornell (1922-1989), and Roy A. Cornell (1926-1927). Arthur's father was a First World War veteran who worked as a coal carman and as a milkman. His sister Eva had died in the flu epidemic which swept the country at the end of the First World War. Arthur worked as a shop assistant and as a milkman for the Co-operative Society and became a Territorial Soldier when aged 16. As such he was called up at the outbreak of the war and went abroad in 1940. 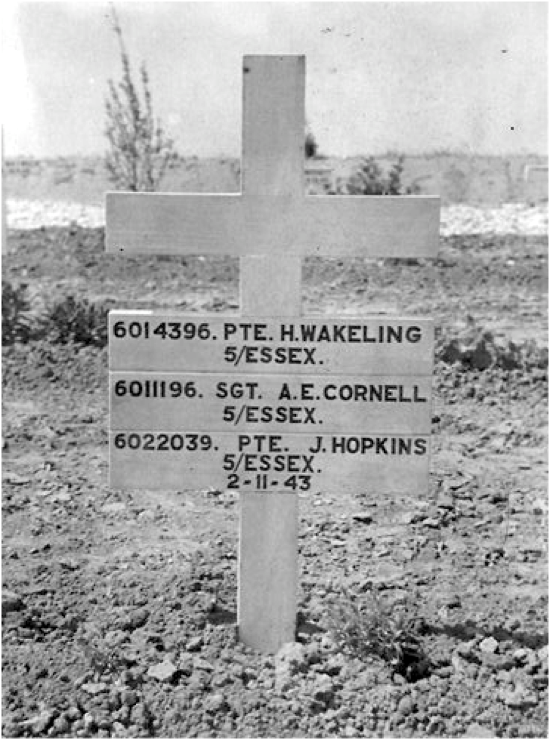 He served as Lance Serjeant 6011196 in the 5th Battalion of Essex Regiment. He was killed in action in Italy on 2nd November 1943, aged 26. A fellow Chelmsfordian, Richard William Hudswell died the same day and lies in the same cemetery as Arthur; Arthur is buried in collective grave XIV. C. 33-35 at the Sangro River War Cemetery in Italy. At the time of his death Arthur's mother was still living at 5 Railway Street. His brother Christopher was also in the army.